A profusion of very similar looking hotels in Mandalay makes it difficult to know what interiors might hold, but as soon as you pass the front door into the very well decorated lobby of Royal City you can see an effort has been made here. The result is definitely an above average pick for the flashpacker category. Royal City is a popular spot and we visited twice, during low season, without being able to see any unoccupied rooms. That means making a reservation well ahead of time is essential; it also means they’re probably offering a very good deal. All rooms are air-con and hot water ensuite, with superiors coming with bathtubs plus tea and coffee making facilities. Staff appeared very helpful and welcoming, even though they didn’t have any rooms. The location isn’t bad, either, being just one block south of the moat. A big plus here is that no high season supplement is charged. If their rooms are half as good as the photos in their brochure, then we’d suggest this is a very good value for money location. 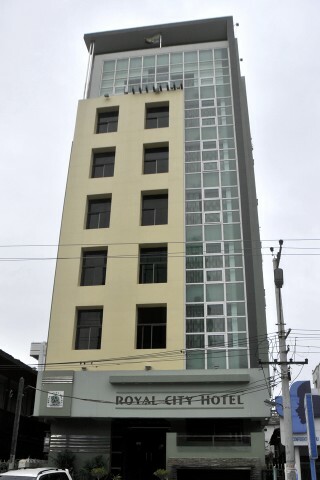 Check rates at Royal City Hotel on Booking.com.